If you’re familiar with Mimikatz, you’ve already seen some of the ways it exposes weaknesses in Active Directory security (if you’re not, read up!). Recently, a new feature was added to Mimikatz titled DCShadow and was presented by its authors Benjamin Delpy and Vincent LeToux at the Bluehat IL 2018 conference. 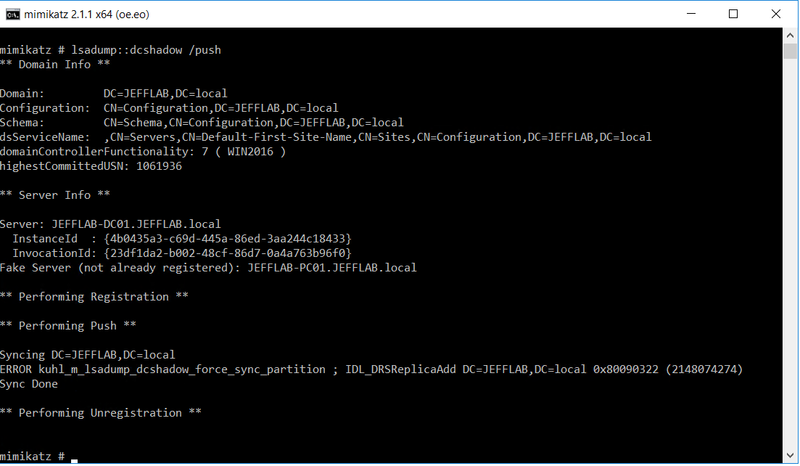 DCShadow enables Mimikatz to make changes to Active Directory by simulating a domain controller. We’ve seen this in the past from Mimikatz, with the DCSync feature, which allows you to replicate password data from domain controllers. But just replicating all of your passwords wasn’t enough, and now DCShadow enables attackers to make changes to Active Directory while avoiding common detection techniques. 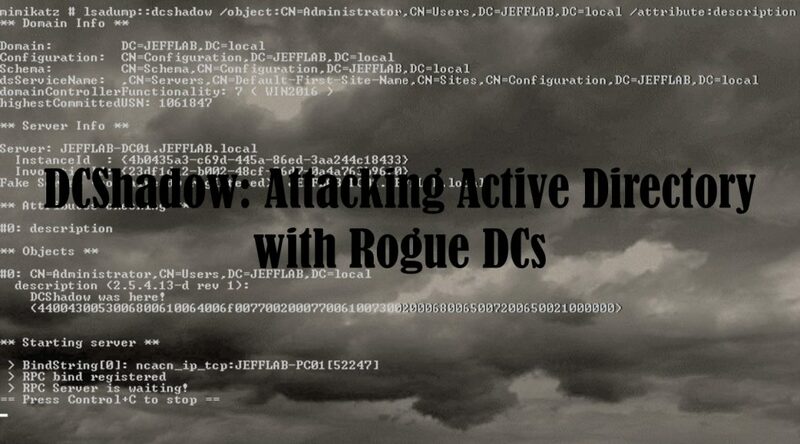 In this series my goal is to provide a summary of how DCShadow works and to look at particular attack paths that are now possible leveraging DCShadow. We’ll also cover how to protect yourself from attacks like these and how to detect if this is happening. Let’s start with the basics: what does DCShadow actually do? An attacker obtains Domain Admin rights and wants to make changes that will not be detected to create persistence. Enter DCShadow. 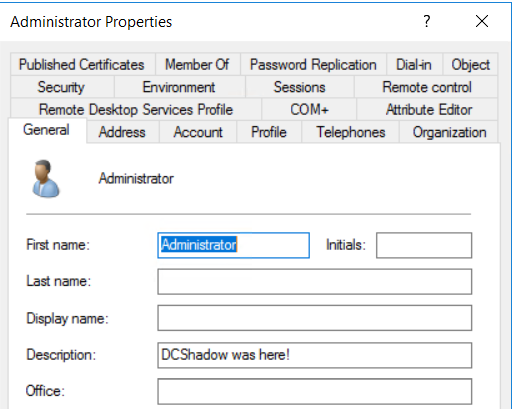 DCShadow will register the computer it is run from (such as a workstation) as a domain controller in Active Directory by making changes to the Configuration schema and the workstation’s SPN values. Now AD thinks this workstation is a domain controller and it is trusted to replicate changes! A change is crafted by the attacker. The workstation makes this change available to a legitimate domain controller through replication. Because the changes are committed through replication, these changes are not logged to the event log how other changes would be. That is normally done on the domain controller where the changes originated, but in this case there is no actual DC where the changes originated from. This is what makes this very difficult to detect. 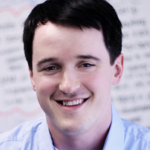 This uses native features of Active Directory so it is not a vulnerability and cannot be patched. This makes it difficult to natively prevent this from occurring. So you can imagine why this is a scary attack for most security defenders. DCShadow provides the capability to make critical changes to Active Directory’s security, and these changes cannot be detected or prevented. DCShadow relies on having Domain Admin rights within the domain, so it should not be considered a privilege escalation tactic. Rather, it is a means of creating persistence through changes to the environment without detection. We’ll get in to some of those changes in a bit, but let’s start by getting this attack working. Once you launch Mimikatz through PSExec in this manner you should be able to see what context you are running under with token::whoami and then use token::elevate to be sure all threads will run as SYSTEM. Now you should be able to push a change set without issue. Let’s craft a simple change to start, such as setting the description of the Administrator account. This will just illustrate the attack, then we’ll get into the actual attack scenarios which involve more complex changes. We did it! That was surprisingly easy. In our next post we will look at how this attack can be used to push changes to AD which can create persistence for an attacker while avoiding common detection techniques. Do not have the labtime to test it myself. So my question: Will the changes which are made on the fake DC be visible on the auditlog of the realDCs? IMHO the auditlogging is done per DomainController where the Change has been done. So i guess this technique will evade the AD auditlogging? That’s exactly right, normally this would be logged on the domain controller where the change was made but in this case that isn’t an actual domain controller so it bypasses detection that relies on event logs making it very difficult to know what was changed even if you can detect the attack occurred. Hello, I want to know, can I copy the normal DC to the DC we created? In the DC Shadow attack, a new DC isn’t really created. Entries are added to force replication from a non-DC and a change set is staged so when the replication is triggered a change will be retrieved and committed to the domain. This attack is focused on leveraging the minimal rights and changes needed to perform this replication event, and not create an entire new domain controller which is part of what makes it so clever/scary.